Can any Californians care to explain this sign, because they should be able to, after al they have lived with it for a few years. Ok so I know that diving into water with rocks sticking out is not something that most people would do unless they are a little bit insane or tipsy, but if someone has jumped and below them there is water (and rocks of course) then they won’t be able to follow the instructions of 50% of this sign will they? 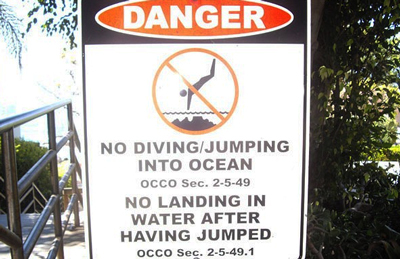 Isn’t it enough just to say “No diving/jumping into the ocean” here? I think so don’t you! Not only that if we go back to the lower portion and weather irrelevant part of the sign, they say nothing about ‘diving’ into the ocean as they do in the first part, so is that allowed? Can you land in the ocean if you simply dive in? And does that countermand the first portion of the sign? You humans are as confused as your signs aren’t you!